Did you know that Germany happens to be the only country that serves the McDonald’s McRib sandwich year round? I bet that interesting fact about the McRib in Germany isn’t in your guidebook! 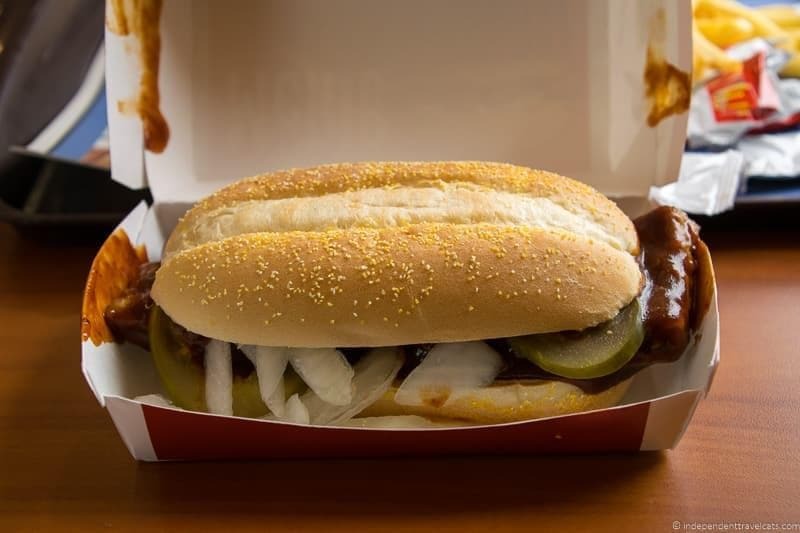 For those of you who don’t know, a McRib consists of a boneless pork patty, barbecue sauce, onions, and pickles served on a long roll that was first introduced by McDonald’s in the 1980’s, but didn’t become part of the permanent menu. McRib sandwiches have a legendary cult following in the United States and the sandwich often appears suddenly on menus to then disappear again with similar gusto with no word on its return. There have been many “Farewell McRib” tours and even a “Save the McRib” campaign, but so far the McRib keeps coming back. While the McRib (and its variations such as a chicken McRib) have made appearances on menus around the world, I believe that Germany is the only country that includes the McRib on its regular menu year-round. 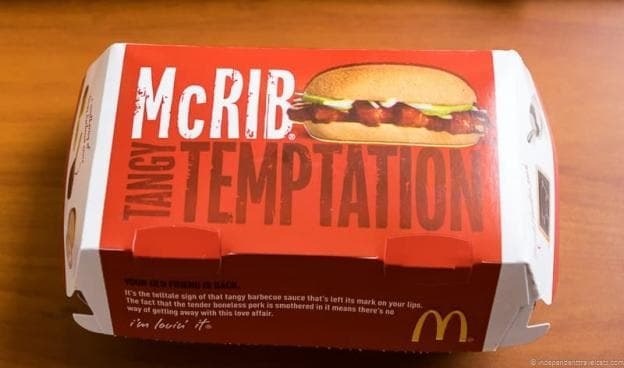 OK, so first let me admit that I get really excited when the McRib pops back up on menus and I always try to have at least one McRib (or three) before they disappear again. Try not to judge me for liking and eating some sort of barbecue slathered rib-shaped pork patty from McDonald’s. I admit it is not the tastiest thing in the world and certainly not the healthiest, but it always makes me happy. Probably because I used to eat them occasionally growing up in the Midwest so it’s the nostalgia more than the taste. It is also a sandwich that is hard to get tired of as it keeps disappearing for long periods of time. The McRib was first officially introduced on menus in 1981 in the United States but has never been part of the regular menu in the U.S., but makes an appearance every so often for a limited amount of time. We had heard that the McRib was so popular in Germany that it was served year round. So we found ourselves in Germany last year, and tried all kinds of great German food. But after a couple of weeks of mainly subsisting on hearty German food—wursts, sauerkraut, potato salad, leberkäse, spätzle, cakes—we headed to a McDonald’s to test out the myth of whether or not the McRib truly exists in German McDonald’s year round. Well, to be honest, it also happened to be that McDonald’s was the only place open in the evening on Pentecost Sunday in Friedrichshafen. We got to the counter and were not disappointed—the McRib really is on German McDonald’s menus! So I ordered a McRib and some fries and chowed down. There we were eating a McRib in Germany. So perhaps it wasn’t on my travel bucket list, but I can now say that I ate a McRib in Germany, the only place they exist permanently on the menu. Perhaps it wasn’t the greatest cultural experience, but we had a lot of fun and the place had sort of a festive atmosphere with lots of local teens and twenty-something trying to get in some time with their friends during the long holiday weekend. Sometimes it is nice to just sit back with some familiar food in a familiar place and take a break from cultural sightseeing. And for those wondering if the McRib is still around, yes as of 2018, the McRib is still being served daily at many McDonald’s locations around Germany! Have you seen the McRib in Germany? Or have a similar experience of just needing to take a break to do something familiar during while traveling? I live in Guatemala and at McDonald’s they put different “specialty” burgers and breakfasts almost every 2 months, now you can get a Brazilian style burger and a Chicken Parmesan burger as a promotion for the FIFA world cup. The normal breakfast has scrambled eggs, black fried beans, beef patties, maize tortillas and fried plantains. The weirdest flavors always get out on summer: a mango pie or maracuya sundae, but I think those aren’t that popular. I’ve never tried it. The McRib you can get it once a year in November I think. Hi Gabby, thanks for sharing! Yes, it is so fascinating to see the differences in food served in a standard fast food place across countries and cultures. In Bulgaria they serve fish fingers at McDonald’s. Seems they have different stuff in most countries. That’s amazing about the McRib. I’ll have to drop that little tidbit on Tom if we just happen to be in Germany sometime. McDonalds is one of those places you can find just about anywhere, it seems, which works out great for my husband. He has four things on his list when he visits a new country. First, he wants to know what it costs to rent an apartment for a month. Second, he wants to learn how much it costs for a gallon (or a liter) of gas. Then, he wants to learn how to say “Thank You” in the local language. And finally, he wants to know how much it costs for a Big Mac. 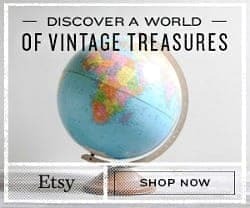 Those four items give him an overview of each country he visits. I wonder if he’ll substitute a McRib when we go to Germany? I went to McDonalds when I was in Germany too…I was super excited to find a veggie burger on the menu! Yes, they also have a McBaguette sandwich in Paris and they sell macarons:) It is interesting to see the differences in the same franchises across countries. This is really funny only because I never heard of the McRib leaving the States. I generally try to avoid McD’s even in the States, but it’s always good to know that they’re the one thing that will be open when you don’t expect something to be a holiday. Yes, we have actually driven 20 minutes to a McDonald’s in rural France as it was the only place open with public wi-fi in the area on a Sunday afternoon. 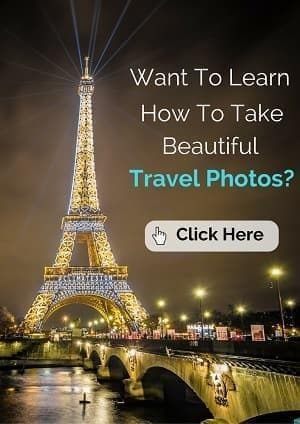 Haha, yes, you should try one just to do it! 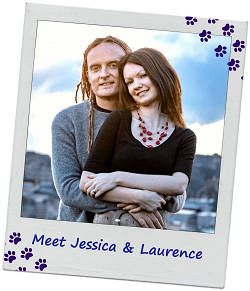 Hi there, new follower from the Happy Kids hop! I live in Scotland, and I’ve been to the McDonald’s a couple of times–mainly for a milkshake or a fountain drink than anything else! Drive-throughs aren’t really a thing, here, and sometimes I miss that, especially with two babies–getting in and out of the car is just too much of a hassle! Yes, drive-throughs can really be helpful, especially on long drives or with kids! Thanks for stopping by! I totally get it. I love McDonalds! When I was a student in Germany we often went to the McDonalds just for something predictable. 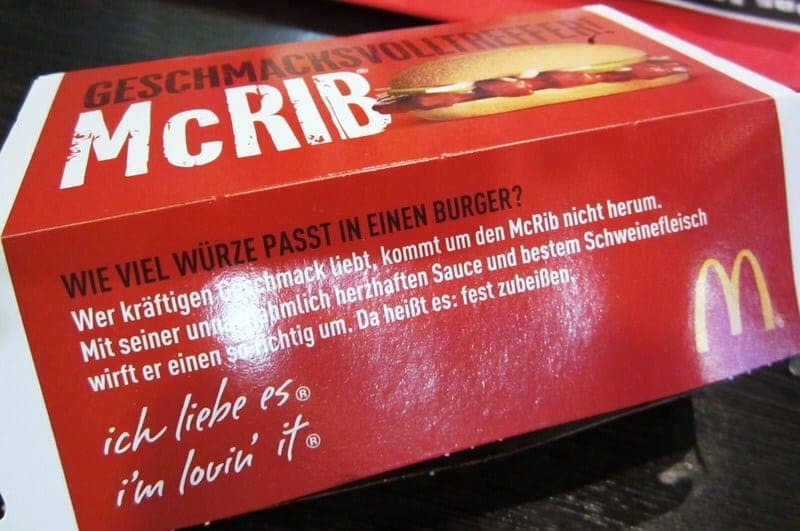 Have to admit I’ve never been drawn to the McRib, but it is funny that Germany has it year round. Surprising and predictable all in one! Yes, I think Germans eats more pork compared to Americans which makes the McRib more popular. The other great things about McDonald’s is that they generally have clean free bathrooms and free public wifi. We actually went to McDonalds in Germany as well! I didn’t notice the McRib phenomenon though haha. I agree though, as much fun it is to soak up the culture and food of the place you are visiting, sometimes you need something familiar.